Your goal is to be a professional writer. You want to be paid for your story. When you begin your manuscript start with correct formatting. This way you will be accustomed to seeing it as the first screening reader will see it. Agent, editor, publisher, it doesn’t matter. The industry standards are the same. Picture this: The reader comes in from lunch feeling just a bit sleepy. A stack of manuscripts sits on his desk. She’s ready to start a new one. He pulls the first off the top of the pile: it’s already smudged because the paper is correctible bond. He tosses it in the reject pile. She pulls off the second neatly bound in a leatherette cover. She tosses it. The next manuscript is printed single spaced in a tiny sans-serif font that makes her eyes hurt just looking at it. Toss. Your aim as a professional writer is to present your story in a professional manner. You’ve read the tip sheet from the publisher and followed all the guidelines. You know the industry standards. Your goal is to be part of that industry. As Chris Roerden says in Don’t Murder Your Mystery (Bella Rosa Books, 2006): The writer is expected to do whatever it takes to come up with a profitably publishable manuscript. The next manuscript is yours. She has it in her hands. She idly flips through. 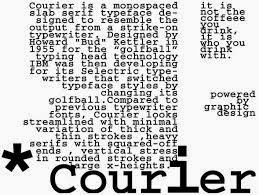 Yes, Courier font (not Courier New), double spaced, wide margins for notes, crisp clean 8 ½ x 11 inch paper (no perforated edges, no three-hole punch), loose pages numbered sequentially, held together by a large rubber band. She starts to read your story. Make certain to read the publisher's submission guidelines. For example, online submissions often require either Arial or Times New Roman font.